Distillation: Operation and Applications—winner of the 2015 PROSE Award in Chemistry & Physics from the Association of American Publishers—is a single source of authoritative information on all aspects of the theory and practice of modern distillation, suitable for advanced students and professionals working in a laboratory, industrial plants, or a managerial capacity. 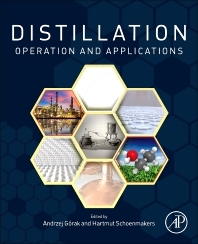 It addresses the most important and current research on industrial distillation, including all steps in process design (feasibility study, modeling, and experimental validation), together with operation and control aspects. This volume features an extra focus on distillation applications. Dr. Hartmut Schoenmakers studied physics and chemistry at the University Heidelberg, Germany. He joined BASF AG in 1976 where he worked as a process engineer in the field of fluid separations with a focus on hybrid and reactive processes, miniplant and scale up technology, and as project manager. Further interests have been process simulation and CAPE concepts. He has been a member of various national and international scientific associations. In 1987, he received the German Arnold-Eucken-Award.